Countdown. 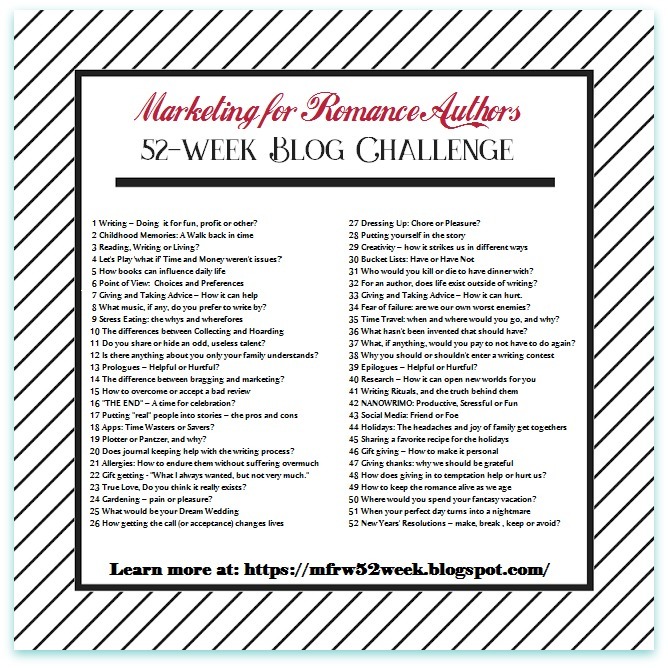 Marketing For Romance Writers 52-Week Blog Challenge Blog Hop. I don’t think I have a right to give advice to new authors, when so many in my groups have been published authors for many years with TONS of books and experience. However, I can mention a few things I’ve learned along the way to this point. Maybe what I’ve learned will work for you, too. After you write the book, write another one, then another…and another. Don’t pay a publisher to publish your book. They should pay you. Don’t hire an agent who gains most of their income from editing. I nearly fell into this trap. Well-established companies don’t usually contact you for business. 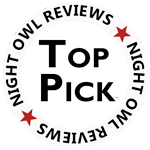 Ask other authors if they’ve heard of the company, promo site, etc. Thank you very much, but I’ll hang on to my hard-earned money. I choose who I want to promote my books, and me. To be fair, on occasion, I hear where authors had good luck with a company that contacted them. Ask questions. As an Indie author, I’ve learned to write the story that calls to me. I don’t write fast enough to write what is hot for the moment, or trendy. Commitment to a writing career. This is a job. If you love it DON’T GIVE UP. At the end of a writing session, stop at a place in your manuscript where you can pick up the next day or next time. This is extremely helpful for me to sit down the next day and know where I’m going. Who else understands us like other authors? Successful authors that I’ve met have been encouraging and helpful by forming groups, doing workshops, and more. It’s easy to fall behind if we don’t keep learning. It’s amazing how fast things change in this business. If it isn’t technology changing, it’s publishers and vendors dropping off the face of the earth, or new ones popping up. Writing tools come and go. Algorithms change. Rules change. Keep learning. In my early years, like eons ago, I didn’t think I needed an editor. I’m on my fourth one since 2012 after saying farewell to two. I’ve learned not to pay full-price up front. I’ve learned that an editor shouldn’t keep a manuscript for ten months. This is a good place to stop. I didn’t look forward to this topic, but I jotted down some thoughts because I wanted to keep up with the challenge. Before I knew it, I had a few pages of things I’ve learned so far, but I tried to pick out what I thought would help a new author. We have one more week in 2017 and the 52-Week Blog Challenge Blog Hop. If you haven’t visited the other authors, this might be a good topic to drop in on. Thanks for visiting! I’m a little under the weather right now. I might be slow in responding. Great post!!! I agree with the keep learning. That is very important in life, and in this business. Great tip on the editor. I’m still figuring out these things and want to make sure I’m using people that are not going to be scammers. Thanks. I’ve been learning this morning. 🙂 I swear I will get basic HTML down one day. Get references, Meka. My experience was rare, I’m sure. Life changes happen with everyone. I love the editor I have now. I believe most editors don’t expect full payment up front, Cathy. Mine didn’t, but I chose to pay up front to one I trusted. It didn’t work out that time though. Wow, Mary, those are a lot of excellent points to ponder. That Editing one surprised me but is very helpful as I am now able to afford one. Great bits of advice! Thanks! Thank you, Raine. I’m glad I had something useful for you. Happy Holidays! Great advice! Thanks for sharing! Mary, you were the first writer/blogger I got acquainted with when I was getting ready to self publish my first novel. You will always have a special place, and a high standing in my heart. Be well, be happy — you deserve it. Holiday hugs and wishes for a healthy, happy, prosperous New Year. Thanks so much, Teagan. You’re sweet to say that. I wasn’t the best inspiration back then and had a lot to learn. You’ve come a long way in blogging. Merry Christmas. I’m wishing the same for you in the new year. Well, you were certainly inspiring to me — still are. Feel fabulous fast. Staying on top of the market and what’s going on is the hardest thing. Great advice. Yes, it is, Shari, and it takes up so much of our time. Happy Holidays. Thanks for the advice, especially that we need to keep learning. Sometimes, I think I spend more time reading “how to” topics on writing and marketing than I do actually writing. Hope you’re feeling better! Me too, Robin, but jeez, I learn so much. I need to start reading more for pleasure now. It’s hard to fit it all in and write. I feel a little better today. Thanks. I agree with everything you said, esp the ‘write what you want, not what you think readers want’…..several years ago, menage was ‘hot’…..but after a while it was easy to see who was comfortable with that plot and who just wrote it because they jumped on the bandwagon! Don’t follow the crowd. In the past, I had written a couple trendy topics before they became trendy, but they’ll never see the light of day. One of my readers gave me a suggestion, and I’ll be writing a book in 2018 because what she said works for one of my series characters. I don’t normally do things like that. Thanks for stopping by, Kenzie! Great advice. I’m jotting them down in my idea book for future reference and bookmarking this post. Thank you! Oh, that’s great to hear, Alicia. With all of us participating on this topic, we’re all bound to pick up something this week. Thanks for reading. Very good advice. It seems there are more and more businesses cropping up to part authors from their hard-earned money! Hope you feel better soon. Thanks, Alina. I’m feeling a bit better today. Have a great holiday. Great advice, Mary. I agree with all of it. Thank you, Ed. Happy Holidays to you and your family. Lots of great advice and some specific suggestions that I don’t see often – especially about relationships with editors. One more week, Mary, and you finished the year’s prompts. Wow! Happy Holidays. When anyone on our publishing team becomes undependable, it’s time to move on. One more week is right! I’m happy that I made as many topics as I did. Now I have to think about what happens on this blog in 2018. Enjoy your break, Diana. That’s always my problem too! Now what do I write?! Agreed. Great advice, Mary. There’s a lot of companies out there waiting to prey on the unsuspecting, it’s always good to be as savvy as you can in this business. So true, Jacquie, and I see it happening often. Happy Holidays to you and your family! Thanks for reading. All great pieces of advice, no matter what state you’re at in your writing career. Thanks for sharing. Thanks, Helen. I’m glad you think so. Enjoy your day.